I love falafels because of my dad. He instilled a love of ethnic foods in all of us. My first falafel memory is an amazing falafel sandwich at a little mom and pop restaurant with my dad. Now when I have the chance to visit home again, my dad and I enjoy sharing conversation over a falafel lunch. Traditional falafels are fried which makes them crunchy on the outside (and oh so delicious!). This baked version is much more tender, but the flavor is fantastic. 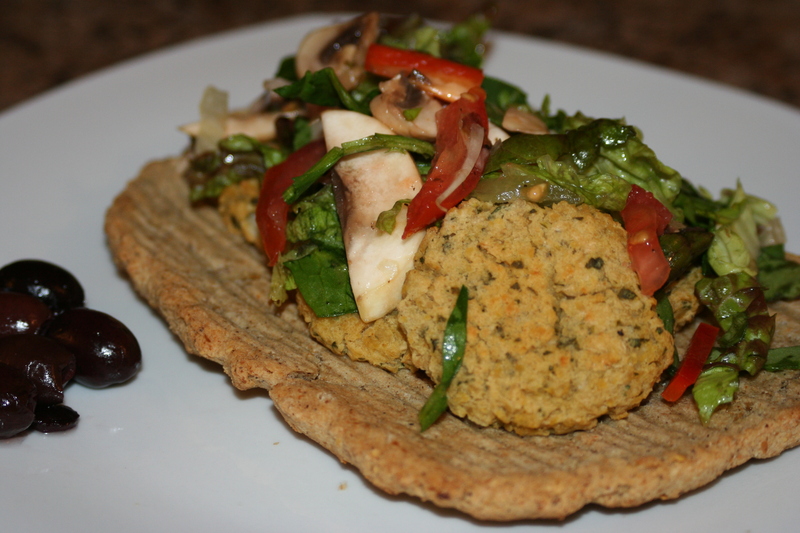 My husband and I enjoyed these falafels piled on top of pita with veggies and homemade hummus. Preheat the oven to 450°F. Set racks in upper and lower thirds of oven. Grease or line 2 baking sheets. In a food processor combine the chickpeas, onion, garlic, parsley or cilantro, spices, flour, baking powder, half of the lemon juice, 1 Tbsp of the olive oil, salt and pepper to taste. Pulse until well combined but mixture is still relatively coarse, you don't want a puree. Using your hands or a small cookie scoop, shape the mixture into 18-24 balls (about 1 1/2 inches in diameter). Arrange on the baking sheets and flatten each slightly. Brush the tops with 1 tablespoon of the remaining olive oil. Bake for 10-12 minutes, then turn patties (rotating trays); bake for another 10-12 minutes. The patties are tender so be careful when turning. Toss the salad veggies with the remaining lemon juice, olive oil, salt and pepper to taste. Serve the falafels with veggies, pita, and hummus (or tzatziki or tahini). I'm going to have to try this recipe. I've been wanting to find some good vegetarian recipes to add to our rotation and this just might be the perfect addition. :) Thanks for the post!